1. Select one of the Virtual Numbers listed right. 3. 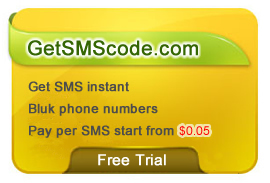 Click the Number Page and Ruquest Refresh to read the sms had Receive. Q: Why not Receive SMS? A: Some times Many user use number to verify same website,May be block by webiste.We suggest you buy a Private Number. Q:Did you update you number? A: We update number monthly.Please Subscribe our website,you will got notice when we update.